Richard Gibson asked me to accompany him to look at a dig in the Alum Pot area one sunny Sunday afternoon recently. I hadn’t been up there for at least 20 years. It brought back many happy memories. 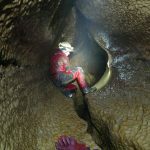 Having nothing to write about on the digging front, I ended up writing about some of my encounters with water over a 45-year period of caving. At 18 years old in 1971, with a wetsuit, wet socks, wellies, helmet and a light, which never worked, you were invincible. With my mates from Skipton, most Sundays dinnertimes we went to The Big Craven for 5 or 6 pints, and after the stripper had done her turn, and we’d had a hearty meal, a bag of crisps, it was time to head up the Dales for a spot of caving. One of the highlights of the trips was sailing down Upper Long Churn in flood on Li-lo inflatable airbeds. You must think I was totally irresponsible and mad, but at that age it was just a bit of pleasure. I’m glad we had our fun early because of that group, only 2 of us survived into our 40’s, the rest having succumbed to cancer and the thrills of the needle. 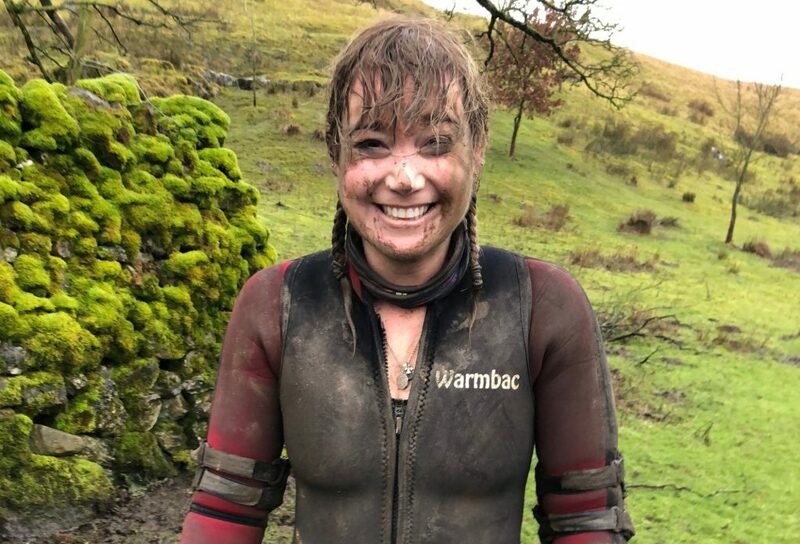 My new wife and I befriended some cavers from Manchester, and when not doing trips in Derbyshire, we’d head up the Dales, where we’d inevitably bump into a loud, wild, group of cavers called the White Rose. I was in my early 20’s, and as well as being very friendly, a lot of the White Rose were crazier than me. So we joined them. On my third caving trip with them, into the far reaches of Easegill, whilst exiting County Pot I met a group of them waiting for me at the top of the entrance. Watto, Sweeney, Mark Lee, Dave Proctor, Barry Wilson and Ralph Murphy all had smirks on their faces as they poured the contents of the helmets over me. Needless to say it wasn’t water and my caving gear stunk for weeks afterwards. I’d been through the White Rose Initiation Ceremony! Then came the Annual Dinner at The Brass Cat, The Golden Lion at Settle. A favourite haunt of caving clubs, Bernard Houghton, the landlord was a wonderful person and kept the bar open till dawn on most dinners. Chris Valley and I being the newest members of the Club, were dressed up in waitress’s uniforms and had to serve drinks to the rest of the members. For Chris this was easy, but not me. At work I was always landed with the new apprentices. The boss said this was because I was not as sadistic as my colleagues. I thankfully had an easy time as an apprentice being partnered up at one time with a certain Steve Warren. Anyway this apprentice repaid my kindness by accidentally knocking over a ladder, the problem being that I was at the top of the ladder at the time. And so I ended up waitressing drinks to members of the White Rose at The Golden Lion with my face full of stitches, a swollen half closed eye, whilst trying to balance a tray full of beer on a pot on my left arm. Later on in the evening there were games involving water and Barry Wilson ensured that most of it ended up over Chris and I. When I went to Skipton General the following Monday to have a wet and soggy plaster cast replaced the dragon of a Sister screamed at me. Watto encouraged me to join UWFRA and took my filled in form to a Committee Meeting at Grassington. When Watto was questioned over whether I was involved in any wild adventure, Watto replied that I camped at The Hill Inn in Chapel Le Dale and so I was duly elected into the team. One early spring after heavy rain on top of melting snow UWFRA were called out on a Monday morning to look for members of a University Caving Club who had been missing in Dowbergill Passage since the previous day. I’ve never seen the water levels so high in Dow Cave but strangely there was no sound of flowing water, it was eerily quiet. Dave Gallivan led first, and he opted to keep dry by traversing ledges above the water, most of the rest of the rescue party including me in wetsuit with Damart thermals underneath, elected to try and wade or swim up the passage. The water didn’t look to be flowing or make a noise, but it was very hard to progress upstream as the weight, current and pressure of the water was intense. I would describe it akin to your worst nightmare where the monster is chasing you and you are trying to run through treacle. When we got to Dowbergill Passage a cave diver went through, I forget which but it was either Julian Griffiths or Dave Morris. The missing cavers were trapped at the back of Buddhists Temple and due to rapidly falling water levels were soon out. On another occasion I was in a party of White Rose doing the Swinsto / Valley Entrance pull through. Included in the party were Joe Querns, John Rockett, Jon and Lynette Cadamerteri, Steve Warren and myself. I think there was other members there but sorry I can’t remember them. It had been raining heavily in the night and morning before our trip but it was fine when we entered Swinsto entrance. Most of the excess surface water had run off by that time and the pitches were not unduly wet. In the Master Cave the water was only about a foot deep (0.3m) but was moving very fast and roaring. But when you put a foot in the stream the force of the water tried to sweep it away, it was quite frightening. I said in a previous article about the enduring image of Hucky at Lockerbie with a Pan Am cargo door on his shoulder. Another is of Steve Warren frantically holding on to a rib of rock to stop the stream from washing him away. Just like a river where the flow is not constant, there are sides where the flow is faster and bits where it slower, so we progressed down the quieter sections of the steamway, almost doing a shuffle to keep both feet on the the floor with body weight evenly distributed to stop one foot being swept away. A caver was not so lucky on a later occasion, he was carried into the sump by the force of water, and drowned. On getting changed outside we saw a flood pulse come down the dry Kingsdale riverbed. The road at Kilnsey used to flood badly, just past the pub, until some bigger culverts were put under the road a while ago. I was travelling up the Dales with Andy Cole, in his big white Vauxhall machine with a Bosch supercharger block on top of the engine to make it go faster. On approaching the Tenants Arms it was obvious that the road was badly flooded, but if you know Andy you’ll know this was just another challenge to him, which he treated with gusto. The bow wave swamped the front of the car and the piece of German electronics fused and popped and put up the white flag to surrender. Of course Andy and his passenger (me! ), had then to wade through waist deep water to reach a phone where Andy could call his ex-wife to rescue us. We had SRT rope in the car that could be used for a long tow. Thus Andy’s magnificent white charger ended up being towed out of the floodwaters by his ex-wife’s Mini Metro. 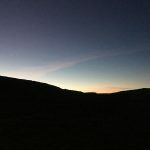 On another occasion the Grassington police were dispatched one evening to apprehend suspicious people, possibly burglars, near the stream at Kilnsey Trout Farm. The ‘unsavoury character’ was found to be a local caver from our club collecting detectors from a dye tracing test, and was suitably rebuked by Sergeant Shakespear. I’m sure the person involved will enlighten you more if you buy him a pint! 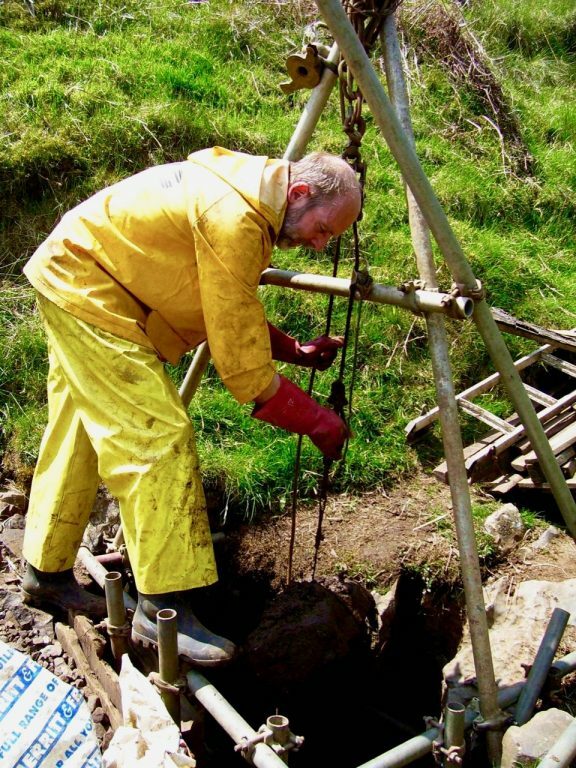 The last tale is about the old dig at Compass Pot in Langstrothdale, not the current shaft in the bottom of the shakehole, but a rift higher up, where the stream sank. We built a big sod dam higher up the stream valley to stop the water as it was impossible to dig down the rift with a torrent falling on your head. I was about 4 metres down the rift, and asked Hucky for his beloved crowbar to have a proddle down a crack going off to one side. Unfortunately, I dropped the crowbar down the crack, it went quite a distance, lost forever. Hucky was not happy about the loss and was doing a lot of chuntering on the surface. This suddenly changed to humming / singing, but too late I realised it was the theme tune from the famous film about the 633 Squadron, ‘The Dambusters March’, before I was hit by a deluge of water, hardly able to breathe till the flood had subsided. There are thousands more tales to tell, perhaps I will do some more another time?